There’s a euphoric feeling that comes along when first opening a skincare product you’ve been lusting after. The whipped deliciousness of that untouched facial cream is orgasmic. If you’re anything like myself, you spend a shameful amount of time endlessly scrolling through product reviews, reading every Into the Gloss top shelf and diving deep into Reddit’s SkincareAddiction. Skincare has become a crazed phenomenon, especially over the past couple of years. We’re all searching for that one product, a holy grail if you will- the product that will change our lives and, more importantly, our less than imperfect complexion. But something I’ve come to a defeating realization is, does it even exist? “You have a problem,” my mom tells me every time I mention I found a new product to try. My bathroom is loaded to the brim with barely used ones. Tell me your skin concern and I will have a mask for you. I have bought, sampled or borrowed, what seems to be, every hyped-up, sworn by, holy grail product out there but I still have the same damn acne scars in the center of my forehead and continue to get my fair share of pesky blemishes. I’m starting to believe that holy grail is a myth made up by over ecstatic reviewers that want to feel as if they’ve discovered the secret bottle of perfection. The term ‘holy grail’ is so ubiquitous in the beauty world that it begins to lose its meaning. It’s also entirely subjective. One person’s holy grail may be another person’s nightmare product that caused them to break out. But, do we even know where the phrase originated from? If you want to get biblical, holy grail is the cup Jesus drank from during the Last Supper. So, how did that turn into something we cherish so near and dear to our skincare devout hearts? The holy grail was an enshrined sought-after chalice and over the years, it turned into a term that also refers to a ‘can’t live without’ beauty product. Allure defines it as something “so essential to your makeup routine and/or life that you’d rather get run over than see it discontinued.” Seems a little dramatic but alright. I think a large part of why the holy grail concept has latched on so tightly is because we want to feel like the product that others swear by works for ourselves as well. We want to be a part of that hype. If it works for all of those reviewers, it has to work for me as well. If not, what is wrong with me? What’s funny to me is that even when we are disproven so many times that one product will change our life, we don’t listen and continue the search. I may be slightly annoying in saying this but a holy grail product is just the false commodity of excellent marketing and publicity. We want to believe so badly that something as little as patting a few drops of serum in every day can turn our skin into something incredible, but it just isn’t that simple. Genetics, diet andproducts all come into play when discussing a healthy complexion. If you truly have a skin condition such as acne, a buzzy, colorful skincare brand from the shelves of Sephora (hello, Drunk Elephant) isn’t going to cure it. Our generation Is completely enthralled with instant gratification- we demand it. At the touch of a finger, we can order a few products, instantly giving us an uplifting feeling of hope. This could be the one! God forbid great skin is something we have to actually work at. Drink more water and eat cleaner? That’s just too boring for us to accept. This will probably come across pessimistic but take it from someone who has spent (wasted) thousands of dollars on over the counter products, searching for something that wasn’t there. Sure, there are products that do their job and may even help tame redness, scars or blemishes. But, in general, are they really worthy of being labeled a holy grail? The entire concept seems like a dramatic, overused myth. I blame Sephora and Makeup Alley reviewers for such a term, duping the world into buying unnecessary products which I am, clearly, a bitter victim to. Getting a new product today before dissecting all possible reviews seems utterly barbaric. Whether or not you realize, there is a hell of a lot of power in the words you put together for an online write up. For instance, I can scroll through dozens of high praises but I’ll come across one that insists said product ruined their skin and I’m immediately hesitant- leaning towards completely turned off. This is why it comes as no surprise what Sunday Riley was caught doing—practically forcing employees to write incredible reviews for their newer products. The company sent an email to out to their team with the subject line “Homework time- Sephora.com Reviews,” going as far as to have them install VPN on their computers to prevent the fake reviews from being traced back to their IP address. What really gets my blood boiling is the way they instructed everyone to come across relatable, like they’ve struggled with acne and know how hard it is but that their products changed their lives, curing them. It’s beyond insulting to everyone, especially those who’ve really struggled with their skin, spending their hard-earned money on products, relying on reviews to make a choice. How can we trust them anymore? There are solutions. In my opinion, the best places to find honest reviews is Reddit and Facebook. Recently, I joined a group on Facebook, started by New York Magazine’s the Strategist, called the Beauty of it All. A place where, primarily, women- but it’s open to anyone- come to discuss their favorite skin products, ask for advice and just give themselves a general dedicated space to talk to likeminded individuals who have the same interests they do. There’s a certain accountability in using a social media platform, such as Facebook, to review something- putting a profile, but more importantly a real face, to a recommendation. I find myself giddily answering the questions people have in there. Why do I, and the others, get so excited to answer a stranger’s question about giving them a new cleanser to try when they ask for a tip? I feel the need to instantly chime in letting it be known that mine is the best, not Caitlyn’s! But then, I google the ones every other user is commenting to see if, perhaps, I’m missing out on something potentially amazing. This is what I call skincare FOMO. I have a few products that I know I can rely on (shout out to IS Clinical and Biologique Recherché) but what if there’s a product out there that could give me the flawlessly smooth, lit from within skin of Jessica Alba that I’ve long strived for? Thus, my never-ending search for the product that probably doesn’t exist. Something I’ve noticed myself doing is once my skin is completely clear, I’m bored. I need something to fix in a way. It’s kind of like, what do I do now? It’s this vicious cycle of continuing to try new products that have amazing reviews and then my skin gets angry from all of the new ingredients hitting it at the same time and I break out again, not even knowing what product caused it. And then I go back to what I know will calm it down and do it all again. Albert Einstein said it best when expressing that the definition of insanity is doing the same thing over and over again but expecting different results. One of the biggest movements in the industry right now is the focus on clean skincare—generally meaning no parabens, phthalates, artificial fragrances, sulfates, silicones, etc. And the great thing about living in the Bay Area is the abundance of smaller, thoughtfully produced skincare brands that keep their goods free of toxic ingredients. Typically, though, skincare labeled as ‘clean’ is more expensive. But, something I wonder a lot about this topic is if it’s really worth it? For instance, the local brand Vintner’s Daughter. Their Active Botanical Serum has become an online phenomenon that everyone from Goop to Into the Gloss has covered with remarkably high praise. What is a little crazy to me though, is that for a whopping $165 you only get one fluid ounce. Yes, the product is good, but do we need to spend a heavy chunk of money on something we gently press into our face? To each their own—but if you can’t afford it, don’t feel like you’re missing out on a miracle product. Going back to the ‘holy grail’ concept, it just doesn’t exist. 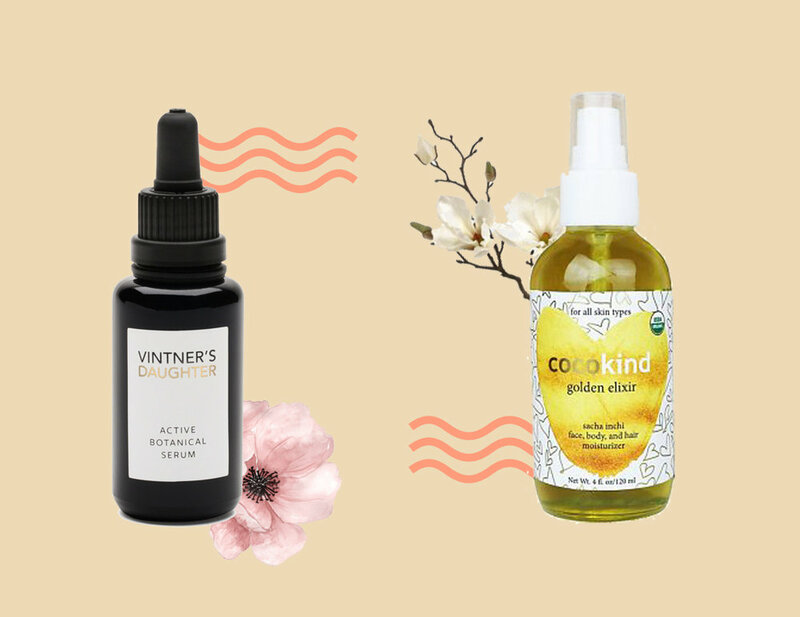 Fellow Bay Area brand Cocokind doesn’t get as much hype or press as Vintner’s Daughter but they have affordable products that you can pick up off the shelves at your local Whole Foods. I’ve been pleasantly surprised at how well they work. Both brands are marketed as clean and nontoxic as well as coming with great reviews but is one superior to the other because of its price point and publicity? No! It’s entirely subjective. Shopping for skincare is such a personal feat. What I’ve learned over the years of hunting for the perfect product is that it’s all about your mindset. Even after my blemishes are gone and I’m complimented on my skin, I still obsessively pick out flaws in the mirror and envy the girls I see on Instagram with flawless skin- even though I know 95% of them edit the pictures I’m scrolling through. The whole thing feels like a vain addiction that I can’t quit. Overall, remember this—just because a product works incredibly well, supposedly, for many people on the internet, it doesn’t mean it will work for you. And that’s okay. Understanding your own skin type and doing the right research will benefit you in the long run. // Feature photo by Jeline Catt. Collages by Anthony Rogers.